The site-responsive project undertaken by Luna Nera in Kronstadt took place over two summers, in 2003 and 2004. The two projects were based on periods of residence on the island together with in depth research about the unique history of the place, and the peculiarities of its landscape. The 2003 project, Cross Encounters, which took place during the 300 year anniversary of the nearby city of St Petersburg, was about the arrival, the immediate impression, exploring the differences and coming to terms with what we found. 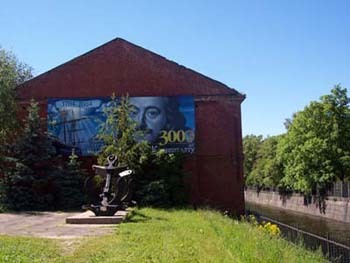 The 2004 project, Interconnection, which was timed to coincide with Kronstadt’s 300 year anniversary, delved deeper, and focused on its role in the history of communication, as the site of the first ever working radio broadcast.